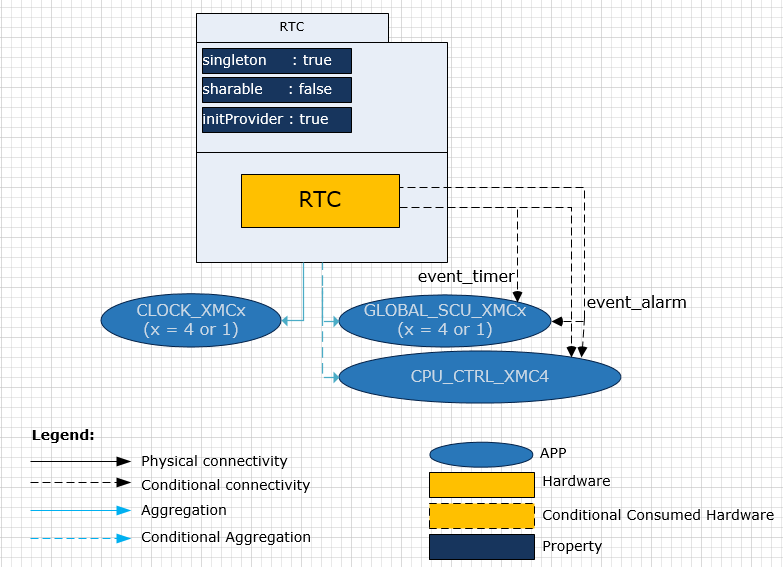 This is the software architecture representation of the RTC APP. The GLOBAL_SCU_XMC, CPU_CTRL_XMC4 and CLOCK_XMC APPs are aggregated. GLOBAL_SCU APP will get consumed whenever event trigger is SCU Interrupt and any periodic event / alarm interrupt is enabled in RTC APP. CPU_CTRL_XMC4 APP will get consumed whenever event trigger is NMI Interrupt and any periodic event / alarm interrupt is enabled in RTC APP. A RTC APP instance exists in a DAVE™ project with fixed attributes and provides output signals for inter-peripheral connections. An instantiated APP (after code generation) generates a specific data structure with the GUI configuration. The name of this data structure can be modified by changing the APP instance label (e.g. changing (default label) RTC_0 to (user defined label) MY_RTC). The following table describes the list of IO signals for RTC APP. This signal gets connected to an NVIC node if any of the periodic events is selected in UI (e.g. Days, Months, Years, Hours, Minutes, Seconds). event_alarm Output Conditional RTC alarm interrupt signal.